There are many options when building a deck, the more knowledgeable the home improvement contractor the better off you are. Learn more about what our team at Chase Remodeling, a division of Insulators Home Exteriors, has to offer! Whether it's a wood deck you want or a composite deck you need for your home, at Chase Remodeling we're skilled at working with both materials and can design, repair and construct a beautiful deck addition for your home! Adding a wood deck is one of the easiest and most inexpensive ways to add value to your home. Even if you're not looking to sell your home in the near future, a wood deck will certainly be a great outdoor entertainment addition to your property! Considering a composite deck? At Chase Remodeling we work with some of the best manufacturers of composite materials to ensure we pass along lasting products to our customers. The most important part of your process is picking a reputable, licensed, bonded and insured home improvement contracting partner. This will help ensure that your Maryland Deck Builder starts with a foundation that is built to code and built to last. “Built to code” is not just a saying but a reality, it is a standard set by county professionals that regulate the best way to build. The Code spells out decks footing depth, post and beam restrictions, joist size and spacing to name a few areas. Make sure you hire a licensed Maryland contractor that is following the code. Once the foundation is built, 80-90% of the work is done after the frame work is completed. This leaves the finishing bulk of the job, i.e. the decking, railing, lighting, trim, staining, etc. All professional deck builders use pressure treated lumber for the posts and framing, and they have to follow the guidelines set by the code. For your decking and railings you might use Pressure Treated Wood or a Synthetic material made out of wood flour composite or plastic cellulose. 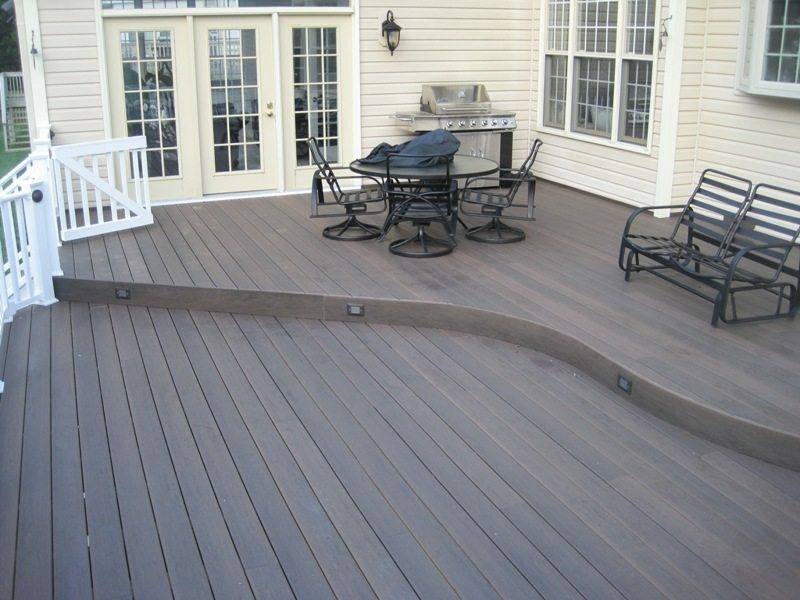 A “Trex” deck or a synthetic/composite deck is referring to the deck boards and the railing.